Publicity Stills of "Sing to the Dawn"
Based on the award-winning novel by Minfong Ho, Sing to the Dawn is the coming-of-age story of a girl fighting for her right to basic education and making true her dreams. Dawan is an average teenage girl growing up in a small Southeast Asian village. But she has bigger dreams and wants more than her small town and traditional way of life can offer. One day everything is turned upside down when her family gets the news that they must pay new taxes or they will lose their home. The entire village is at risk. Somchai, Dawan's father, has a solution. He insists that Dawan tutor her brother Kai so that he can win an upcoming scholarship. Dawan herself will be engaged to Benz, the brutish son of the village landlord, Pairote. Pairote's family money would surely protect her, but the idea of marrying Benz is more than she can accept. Dawan decides that her only option is to win the scholarship herself which will enable her to study in the big city. She succeeds but instead of gaining recognition and respect, her actions only cause more strife for her family. Alone and distraught, Dawan seems to have nowhere to turn when Old Wichien, the village fool and crazy puppeteer, reveals a secret to her. The Ancient Decree giving Pairote and his family ownership of the land is a fake. An authentic decree hidden inside a haunted temple states the land really belongs to the villagers. She also discovers that Pairote has created a lie about the new taxes in order to oust the villagers from their homes where he plans to build a casino. Dawan must selflessly act to find this decree and stop Pairote and his henchman from knocking down the village, as her father and friends stall the inevitable destruction. With the aid of some clever animals and the reluctant help of Kai, Dawan will overcome dangerous obstacles and the traditional limits placed upon her. She saves the village and at the same time, receives her father's consent to study in the big city, making true her dreams. In the quest to produce Singapore’s very own animated movies, our people have come up with two miserable attempts, Zodiac and Legend of the Sea. Even with star voices coming from the likes of Fann Wong and JJ Lin the two movies failed to take our local box office by storm, neither were they successful aesthetically and story-wise. And now, Raintree Pictures has attempted to step up to the plate and offer Sing to the Dawn. Compared to its predecessors, Sing to the Dawn has the most potential to be a hit. It was after all, a secondary school literature text for a good number of years, its writer has won acclaim and it has been successfully translated onto the stage in the form of both a play and a musical. So, what can go wrong yes? In this case, everything. 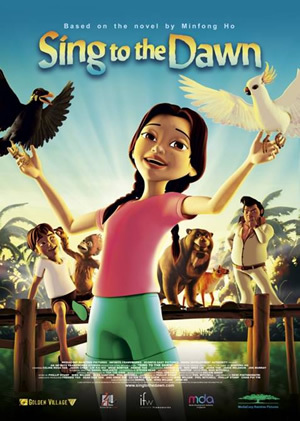 Sing to the Dawn is the tale of Dawan, a young girl, growing up in a South-east Asian village with her family. She is a strong-willed individual, fighting for her right to study in the city much to the chagrin of her very traditional father. At the same time, her family and she must unite to face the village landlord, Pairote, who has duped the villagers in believing his family owns the land, in his quest to destroy the village in hopes of building a casino. The above summary is the same general idea that was featured in the book but additions like Dawan’s father wanting her to marry Pairote’s son and a band of talking animals very much spoils the show. The idea to introduce the talking animals I believe was an attempt to make the story a bit more accessible to children. This only adds to the confusion that I went through for a good 80 minutes. Condensed into the 80 minute runtime, Sing to the Dawn becomes paper thin. Even Dawan’s quest to overcome the sexism she encounters from her father and the rest of the village becomes more of a passing thing rather than the focus of the story. The movie is a messy affair considering the characters themselves are confused. The story may be set in South-East Asia but the accents were terrible, they just were not consistent with the location. Despite the accents galore, there were excellent voices, especially so in the case of Celine Rosa Tan who voiced Dawan. Her rendition of the theme song is probably the best of the lot. There were six original musical numbers in this movie but probably only one that leaves a lasting impression. The rest unfortunately are forgettable and disappointing. Although the animation may have taken months to complete, the end result is still far from satisfying. The characters are stocky, human characters do not move naturally and rendering for characters like the sun bear makes it look more like a boar than a bear. All these combined with several unnecessary scenes like Kai’s kung fu antics makes this feel like a low-budget attempt at animation. Sing to the Dawn should be an okay movie for the children but in general, it is not really that big a step forward for our local animation scene. It appears that a bigger leap forward is needed if Singapore wants to match its counterparts overseas. This movie ends up being one riddled with could-haves making the overall experience quite the disappointment.